A very solid 3 wins and draw in our last 4 games takes us to Brighton feeling confident, and feeling like Pellegrini has finally got his team organised. An in-form Yarmolenko is producing exciting football, Anderson is starting to get settled in and Arnautovic is still firing on all cylinders. We head to one of the favourites for relegation at the beginning of the season – however they are no pushovers having beaten United at their home ground. The Falmer Stadium, known as the AMEX, is a stadium reaching it’s 10th birthday this year having opened in December 2008 after Brighton struggled to find a permanent home. Away fans are in the south east corner of the stadium, including both the south and east stands. The seats are padded all around the ground. Train: The nearest railway station is Falmer railway station which is about a 5 minute walk from the stadium. From London Liverpool Street the train takes about 2 hours. You will have to get the underground to Farringdon, change there for national rail services. From Farringdon go to East Croydon, and change there again for Brighton. When you get to Brighton railway station, you can change to Falmer which is only a few stops away. If you wish to drink, get off at Brighton railway station and read the food and drink section below, before making the 10 minute rail journey to Falmer when you’re ready to head to the game. 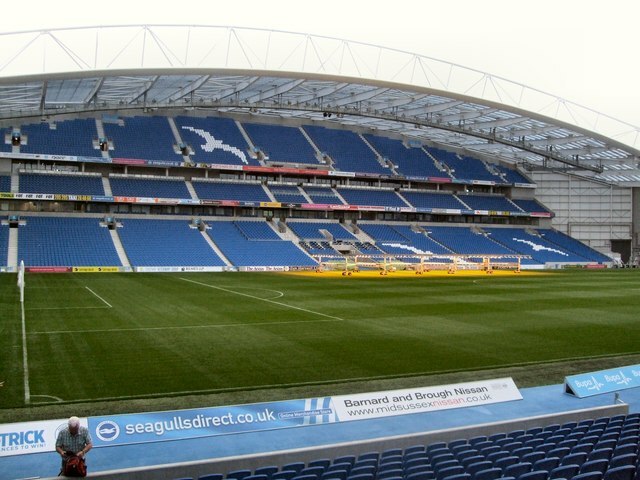 Car: The stadium is located on the outskirts of Brighton in Falmer, close to the university of Sussex. From the M23, continue onto the A23 towards Brighton, then take the A27 exit towards Lewes from the roundabout when signposted. Around 4 miles later you will see the stadium on the right. Parking: There is no parking available for away fans at the stadium, however minibuses are allowed to park there but only if they have been pre-booked. Due to the lack of parking or expensive fees, it’s recommended to just get the train. If that is not an option, parking is available at Bridge Car Park which is a part of the university/community centre. From there it’s a 10 minute walk to the stadium but it can take a while to get out and parking will cost £15. The postcode for this car park is BN1 9PW. There is a park and ride service at three different locations; Mill Road (BN1 8ZF), Brighton Racecourse (BN2 9XZ) and Mithras House Brighton University (BN2 4AT). Mill Road is suggested as the easiest for away fans, but it’s the busiest. You can also park at Lewes railway station (BN7 2UP) and take the train to Falmer. The car park is £6.35 for the day. Please be aware that there is a large permit only parking scheme around the stadium which makes it very hard to park. For this reason, it’s recommended to use public transport as it will probably be cheaper in the long run. Inside the ground are the most expensive pies in the league at £4.20, however they are made on site. There is a choice of Steak and Ale with mushrooms, chicken, ham and leek and even a vegetarian option of butternut squash with spicy tomatoes. They also sell burgers for £4.60 (cheeseburgers will cost an extra 10p) and hot dogs for £4.20. Alcohol is also available at the stadium, they sell Harvey’s Real Ale for £4.30, Fosters for £4.20 and wine for £4.20. Harveys have dedicated 5p from every bottle sold to Macmillan cancer support. Outside of Brighton railway station there’s a few pubs, most notably the Evening Star on Surrey Street. It’s a 2 minute walk from the station however it’s a long walk from the football ground. You can get a Southern Rail train which will take 10 minutes to Falmer train station and then about a 5 minute walk from the station to the stadium if you decide to drink at this pub. The Evening Star pub features on the CAMRA good beer guide. Enjoy the day and stay safe. Cheer on the lads and hopefully we can come home happy with 3 points. COYI!